A beautiful gift for yourself or a fellow Entrepreneur. Each gift set contains: A copy of The Empowered Entrepreneur signed by the author. A limited edition hand poured Clarity Meditation Candle. 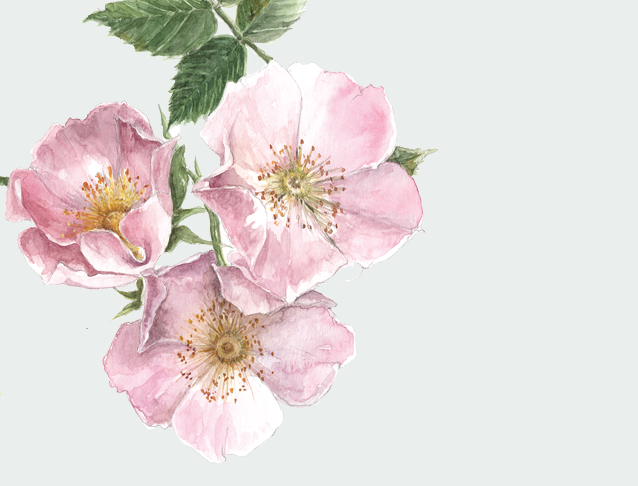 A limited edition print of the original Wild Rose Watercolour signed by the artist. The Bach Flower Essence of Elm, a great support for times of overwhelm. An Empowered Entrepreneur Journal. A planet friendly tote bag. Delivered in planet friendly packaging. If you would like to make your experience of The Empowered Entrepreneur that little bit more special then the gift set is the perfect accompaniment. A signed and dedicated copy of the book. An A4 limited edition print of the wild rose watercolour illustration signed by Gail Jones. A hand poured, pure essential oil, bergamot Clarity Meditation Candle. Your choice of one of three Bach Flower Essences, Cerato, Elm or Wild Rose. An Empowered Entrepreneur Journal. An organic cotton tote bag. All delivered in planet friendly packaging. Bergamot Clarity Meditation Candle collaboration with Pure Thoughts. It has been such a pleasure to have collaborated with Leanna at Pure Thoughts to create a limited edition Clarity Meditation Candle. I asked her to use bergamot, which is not only a beautiful citrus slightly spicy scent that clears room odours but a deeply soothing oil known to enhance feelings of joy energy and clarity. I find it induces a deeply tranquil yet alert state for meditation. This beautiful hand poured, vegan, GMM free, pure essential oil candle will be included with every gift set..
Wild Rose Original Watercolour Illustration for The Empowered Entrepreneur, by Gail Jones of Starkeys Lane. I'm delighted to include a limited edition A4 print of the Wild Rose Illustration from the book signed by Gail, with all gift sets.